Trail riding enthusiast and Equitrekking contributor, Susan St. Amand shares her experience exploring some of Pennsylvania's best equestrian trail riding opportunities and staying at an eco-friendly inn. Creekside Inn and Stables is located in Pennsylvania's Elk State Forest, on the outskirts of the town of Emporium. This small but quaint facility has accommodations for both horses and humans and is pretty cool in that it is a "green" destination, run with 15,000 watts of solar power. The small stable can accommodate five horses in large box stalls. The Inn has several various sized rooms, suited to the number of occupants. Photo courtesy Susan St. Amand. 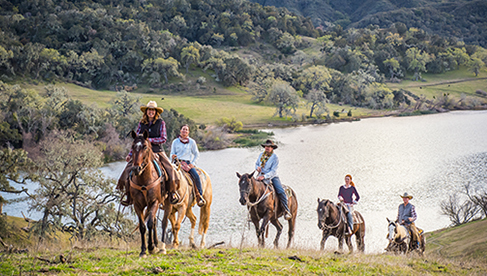 Creekside Inn and Stables is conveniently located adjacent to the Sizerville State Park which makes the trails easily accessible from the stable area. 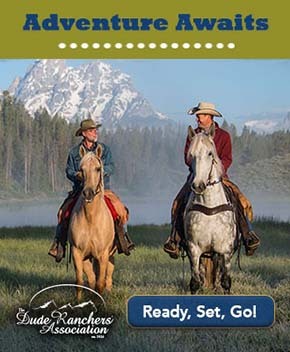 The owners, Scott and Marti, were very gracious hosts and trail guides making for an uncomplicated and pampered riding adventure for these three trail riders who usually have to camp out and trail ride in the “rough”. Sizerville State Park is comprised of 386 acres used for hiking, fishing, and snowmobiling, as well. There are overnight recreational camper sites and a public pool. Both Creekside Inn and Sizerville Park remain busy throughout the fall and winter seasons with these outdoor recreational activities. On the first two days, we rode trails through the Sizerville State Park. On the third day, we rode the Thunder Mountain Equestrian trail, which was located closer to potential elk viewing opportunities. During June, it is possible to glimpse elk cows with calves by their sides. We came across signs of elk such as tracks and droppings, but unfortunately, no live elk. Optimal elk viewing occurs during October, in the fall season when the bulls are actively seeking females to breed, and their bugle mating calls are awesome to hear. Having previously experienced horse camping and trail riding in Elk Country previously during a fall season, I can certainly say it is worth the sights and sounds of the elk, especially experiencing it from horseback. In Benezette, Pennsylvania we toured the Elk Country Visitors Center, where a large elk statue adorns the front entrance courtyard. The visitors center contains a wealth of information and exhibits of wildlife found locally in Elk Country. Maintained and operated by the Keystone Elk Country Alliance, a non-profit organization, promoting conservation and educational efforts on preserving elk and local wildlife. During one of our trail riding outings, we did encounter rattlesnakes, a species of wildlife that I never imagined existed in Pennsylvania due to its colder climate. The three venomous breeds are the Northern Copperhead, Eastern Massasauga Rattlesnake, and Timber rattlesnake. The warning rattling sound will remain unforgettable in my memory. Fortunately, it did not strike out at any of the riders, as we quickly rode through. Another interesting place we visited is the Kinzua Sky Walk at the Kinzua Bridge State Park in nearby Allegheny National Forest. This civil engineering wonder was originally built in 1882 and completed in 94 days to accommodate train traffic from north to south. In 1963, the viaduct was purchased by the State of Pennsylvania for a future park site when the demand for transported goods on trains decreased. It was then utilized for excursion train traffic. From 2002 until 2003, excursion and public use of the viaduct were halted in order to begin much-needed repairs. Soon after, a tornado ripped through the structure. The wreckage can still be viewed today in its original state. The park then proceeded to repair and salvage only one end of the viaduct and convert it into a “skywalk”. Tourists can walk out to the end of the Skywalk and see the spectacular views of the river bottom and forest valley surrounding the area. At the end of the Skywalk, you can step onto a clear floor and view the park ground below. It is not for the fainthearted, such as those fearful of heights. Otherwise, it is an interesting and unique historical wonder. About the Author: Susan St. Amand is a Board Member of the Shenandoah Trail Riding and Horseman's Association in Shenandoah County, Virginia. She grew up in Northern Maine with horses on a farm and has been a transplant to Virginia for the past 26 years. A retired Youth Education Technician, she enjoys planning horse vacations with friends and has currently completed many rides in Maine, Pennsylvania, New York, West Virginia, Tennessee, North Carolina, as well as Virginia, trailering her own horse.